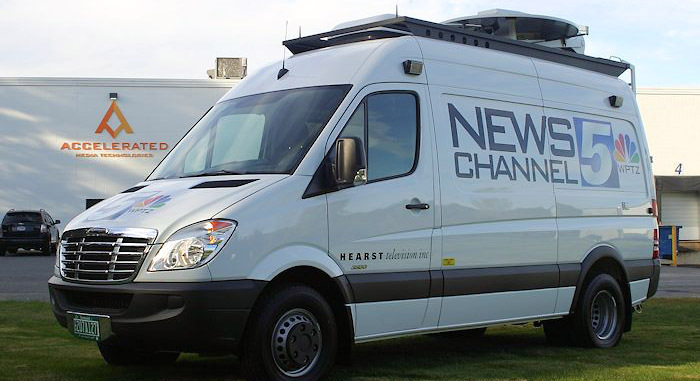 For as long as there have been ENG/DSNG Trucks, broadcasters have been asking for an alternative to traditional generator based power systems. Noise, exhaust fumes, high maintenance costs and missed live shots attributed to generator problems have been the bane of every news department. Accelerated Media was up for the challenge and has developed an alternative inverter based UPS type power system. This innovative power system, named the MVP™ Power System employs a 12-28V Mil-Spec high amp alternator, two-four 12V Mil Spec AGM or Lithium batteries, a PREMIUM critical Inverter/charger and a real time LCD control/monitoring system which displays power load and capacity data. Integrates with OEM Power System SEAMLESSLY with NO Warranty Issues or CEL Light!